Starting Aug. 17, state waters off Gulf County, including St. Joseph Bay, will open to bay scallop harvest. This area will remain open through Sept. 30 and includes all state waters from the Mexico Beach Canal in Bay County through the westernmost point of St. Vincent Island in Franklin County. See below for more on other areas open to harvest. Harvesting bay scallops is a fun outdoor activity in which the whole family can participate. It also brings an important economic boost to coastal areas in the open region. The bay scallop population in Gulf County’s St. Joseph Bay appears to be improving, but is not yet fully recovered from the impacts of a fall 2015 red tide event. Ongoing restoration efforts will continue through the season. In order to maximize the success of these efforts, swimming, boating, fishing and scalloping in the restoration area marked with Florida Fish and Wildlife Conservation Commission (FWC) buoys south of Black’s Island are prohibited during and after the scallop season. These season dates are for 2018 only. 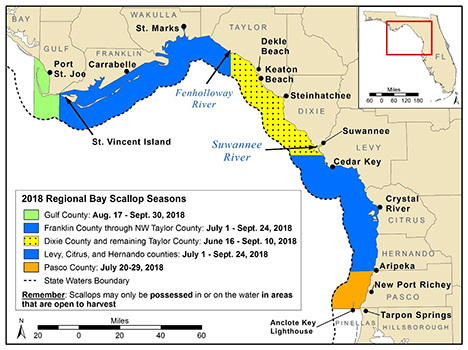 In late 2018 or early 2019, the FWC will set the 2019 seasons for Gulf and Pasco counties, consider continuing the 2018 regional season structure for the remaining portions of the open scallop harvest area in 2019, and will work toward creating a more permanent season structure for 2020 and beyond. As the 2018 season moves forward, share your comments on what you would like to see for a future season structure at MyFWC.com/SaltwaterComments. The FWC is very interested in understanding whether the public prefers regional differences in the season dates or a consistent season across the harvest area, as well as what season dates work best for various regions. Public feedback will be an important factor for determining whether further changes are needed when making a decision about the long-term season dates. Be safe when diving for scallops. Stay within 300 feet of a properly displayed divers-down flag or device when in open water, and within 100 feet of a properly displayed divers-down flag or device if on a river, inlet or navigation channel. Boat operators traveling within 300 feet of a divers-down flag or device in open water or within 100 feet of one on a river, inlet or navigational channel must slow to idle speed. For more, visit MyFWC.com/Boating/Regulations and click on “Divers-down Warning Devices.” Always remember to properly stow divers-down devices when divers and snorkelers have exited the water. St. Joseph Bay and Gulf County: Aug. 17 – Sept. 30. This region includes all state waters from the Mexico Beach Canal in Bay County to the westernmost point of St. Vincent Island in Franklin County. Franklin County through northwest Taylor County (including Carrabelle, Lanark and St. Marks): July 1 – Sept. 24. This region includes all state waters from the westernmost point of St. Vincent Island in Franklin County to Rock Island near the mouth of the Fenholloway River in Taylor County. The remaining portion of Taylor County and all of Dixie County (including Keaton Beach and the Steinhatchee area): June 16 – Sept. 10. This region includes all state waters east of Rock Island near the mouth of the Fenholloway River in Taylor County and north of Alligator Pass Daybeacon #4 near the mouth of the Suwannee River in Levy County. Levy, Citrus and Hernando counties (including Cedar Key, Crystal River and Homosassa): July 1 – Sept. 24. This region includes all state waters south of Alligator Pass Daybeacon #4 near the mouth of the Suwannee River in Levy County to the Hernando – Pasco county line. Pasco County: A trial 10-day open season was held July 20-29. Done for the day? Help FWC’s scallop researchers by completing an online survey at svy.mk/bayscallops. Harvesters can indicate where they harvested scallops, how many they collected and how long it took to harvest them. Participants can email BayScallops@MyFWC.com to ask questions or send additional information.